Watch a video about Punta Gorda! 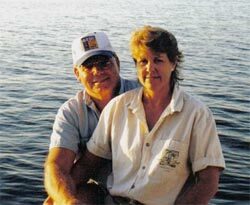 Harry and Cady Rowe are experienced Realtors® in all forms of Punta Gorda and Port Charlotte real estate. Harry Rowe: Born and raised in the greater Boston area, Harry built a waterfront home in Punta Gorda Isles and relocated in 1982. He has been a Realtor® in Punta Gorda since 1984 and offers his clients a wealth of experience and knowledge of the local real estate market. Cady Rowe: Born and raised in Western Pennsylvania, Cady graduated from Bethany College in West Virginia with a degree in Education. Cady arrived in Punta Gorda in 1994 and worked as a local flight instructor for a number of years before eventually joining Harry in real estate in 2005. Both Harry and Cady are avid boaters, canoeists and kayakers and when not selling real estate, can be found somewhere cruising the local waters. It is our belief that honesty and integrity are the foundation of any business relationship. We guarantee that these qualities will be extended to you when you choose us as your Realtors®. If you would like a detailed tour of the area by honest and knowledgeable Realtors®, contact us, we'll show you around.